Simple & Sincere: You're a Star! Happy Monday! 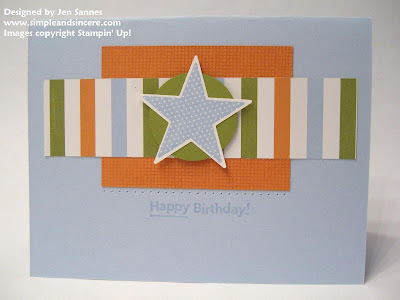 Today's card is a super quick and easy birthday card from my 10 Cards for $10 class last Saturday. I love the simplicity of this card, plus it's fun! Our theme for the class was Retiring Stamp Sets. 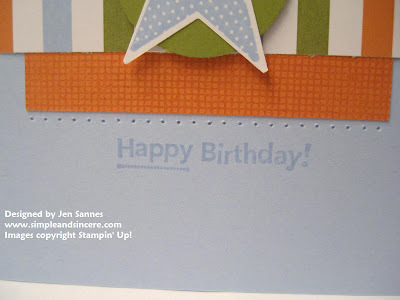 This card is as easy to put together as it looks! I started with a Bashful Blue card and stamped the Canvas background onto a piece of Pumpkin Pie cs with the same color ink. I layered a strip of Summer Picnic dsp over the Pumpkin Pie panel and added the star image from the Classic Backgrounds set layered onto an Old Olive circle. I added a little paper piercing (of course) and stamped the sentiment near the bottom of the card.